Institute's Michael McCrudden celebrates after scoring their equaliser against Ballinamallard United. Picture by Lorcan Dohert/Presseye. Institute showed that they haven’t thrown the towel in just yet. 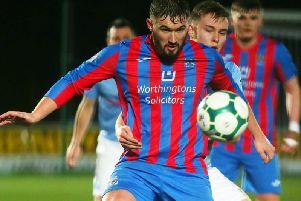 Trailing to Ballinamallard United inside the first minute, another half-time team-talk from birthday boy Paul Kee, meant the Waterside men came out a different side after the break to earn a 1-1 draw, thanks to Michael McCrudden’s second goal of the season. Stute also had goalkeeper Martin Gallagher to thank for the share of the spoils, as the net-minder made a few crucial stops when the visitors were in front. The Drumahoe club made four changes to their side which lost at Ballymena United last week, with Graeme Crown, Peter Bradley, Mark Forker and Davitt Walsh all coming into the starting line-up. Incredibly the visitors took the lead on 27 seconds after more terrible defending by the home side resulted in Liam Martin easily skipping through a few challenges before coolly slotting the ball home from close range. The visitors went close to adding a second just after the half-hour mark when John Currie’s in-swinging free-kick into the six yard box nearly caught out Stute, but a back tracking Dean Curry got a vital touch on the ball to divert it wide. Institute’s only real chance came on 42 minutes but after a teasing run McCrudden failed to get his shot away when inside the box. With the last kick of the half Robbie Hume was inches away from levelling things, but his 25 yard free-kick flew just wide. Just like the first half the visitors went close to scoring but Jay McCartney’s close range strike flashed wide, after ex-Stute man Ryan Campbell had created the chance. Campbell was in the thick of the action again on 59 minutes but his effort was saved by Gallagher, after he did well to hold off Dean Curry to create the opening. Moments later Murphy made a super save to tip over Hume’s powerful right footed volley. Gallagher had to make an equally impressive save on 71 minutes tipping over David Kee’s super 20 yard free-kick. Institute did equalise on 80 minutes thanks to Michael McCrudden’s second goal of the season, when he fired home from 10 yards, after substitute Darren McFadden had set him up. Institute: Gallagher, Crown, McLaughlin, Curry, Bradley, McManus, Forker, McKeever (McFadden 76), Hume; McCrudden, Walsh (McIntyre 63). Subs: Ballard, O’Donnell. Ballinamallard United: Murphy, Hutchinson, Stafford, Feeney, C McLaughlin, McCartney (Noble 86), Kee, Martin, McKenna, Campbell (Beacom 86), Currie (Courtney 90). Referee: Mr Keith Kennedy (Lisburn).